One of my childhood memories, though brief, is indelible. It has been on my mind lately, because the other two people involved have long since passed, and I'm thinking I had better start sharing those moments for others to carry on. The memory is simple: many people are gathered in a tight crowd. My mother is holding my hand as we make our way through it. Somebody is speaking. My mother stops. She lets go my hand, grabs my chin, and turns my head towards the speaker. "See that man?" She asks. "He is a great man." That man was César Chávez. 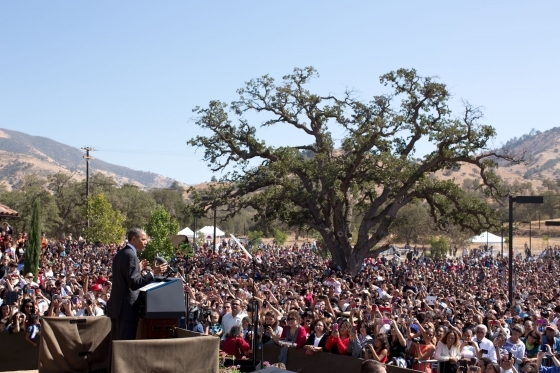 President Obama Speaks at Chávez monument dedication, White House Photo. I haven't yet visited Nuestra Señora Reina de la Paz, which, since 2012 has been protected as César E. Chávez National Monument, but I plan to go and pay my respects to the peaceful man. I want to understand the sense of place, why it was his "spiritual harbor." I'm glad that the president set aside his place of refuge and final resting place for the world to learn about, and reflect upon, a significant part of American history and civil rights for laborers. My mother would be glad, as well as many other Latinos like her, who knew what it meant to labor in the fields California before the United Farmworkers' Movement came along. But I am also remembering my moment with Mom and César Chávez for another reason: I am angry. I am angry that the very Antiquities Act, which gives presidents power to set aside National Monuments, is about to be gutted. I am angry that this executive power, designed to cut through the slow wheels of Congress and administrative bureaucracy to save places of historical and scientific interest, will evaporate if some members of Congress have their way. 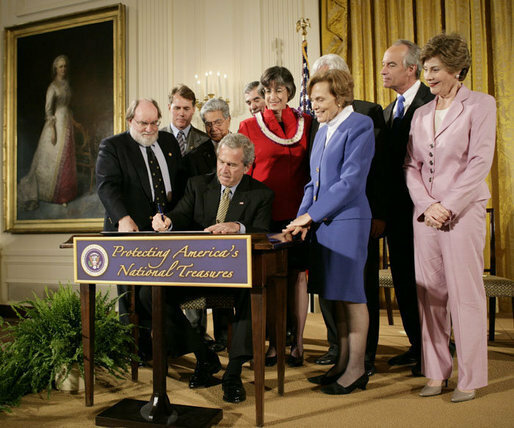 The Marine Access and State Transparency Act (H.R. 330) and National Monument Designation Transparency and Accountability Act (S. 228) are House and Senate bills that would strip Presidents of the power to designate National Monuments, and also require a waiting period before any protections can be put in place on congressionally declared monuments. Senator Mike Crapo of Idaho, who introduced S. 228, claims that the bill is intended to inject "local input and support" into the process of designating monuments, by eliminating an alleged "top down" approach. What he absolutely fails to recognize is that in 2011, President Obama had already determined to "engage the public to identify and recommend potential sites on existing federal lands for protection under the 1906 Antiquities Act." All the public, grassroots support would mean little if a president, who, after study and listening to community requests, would still have to win congressional approval... After all, congressional gridlock and ideological objections to conserving public lands are the reasons people to push for action under the Antiquities Act in the first place. So, what is really behind the desire to eliminate the president's power to protect our heritage? Introduced last month, the bills' timing is significant. Now, while the oil and gas industry has plans to drill its claws deeper into more of our beautiful homeland in the American west, Congress is doing its own dirty work. Perhaps proponents of the bills fear that presidents will protect treasured cultural and natural sites when they are about to be overrun by the greed and speed of petroleum development, or other extractive industries. They certainly intend to keep our presidents from doing so. The crusade against America's public lands is now a national effort, sponsored and produced behind-the-scenes by sophisticated lobbyists funded with torrents of cash from the oil and gas industry, the largest lobby in Washington. What it boils down to is an already wealthy industry run by some of the wealthiest people in the world wanting to take it all. What is wrong with balancing the damage our industries do by protecting the real fabric of this land, the stuff that can't be sold, the stuff that makes us who we are? Why shouldn't we protect our fishing streams or mountain lakes, historic houses or ancestral dwellings? If it takes a president to protect a place, so what? Any president will do. Even George W. Bush designated National Monuments; he designated a vast area of the Pacific, vaster at that time than all the national parks put together, while protecting subsistence fishing and the traditional cultural uses of Native Hawaiians in that area. He also protected a small place, the African Burial Ground, in the costly real estate of Lower Manhattan. President Bush signs a proclamation creating the Papahānaumokuākea Marine National Monument. White House Photo. Perhaps I am not so angry as I am sad. I think about all the places that we value, and how little those values mean to the people who are attacking our public lands. I think about the places such as Chaco Canyon that might have been completely looted, or things that might have decayed away if they weren't protected, like the Statue of Liberty.